Looking for an app to manage your case load of OT/PT/SLP students information and compile notes and treatment artifacts (pictures, etc.)? There are a number of general note taking/ note management apps that can work for organization of client/student information (e.g. Notability, Awesome Note HD). Lisa Brandolo Johnson, PT, one of the creators of Grembe, Inc. apps (developers of iCommunicate , iReward, My Pictures Talk apps ) has created a client/student management app – iConnect – Notes Edition geared to therapists that is free! 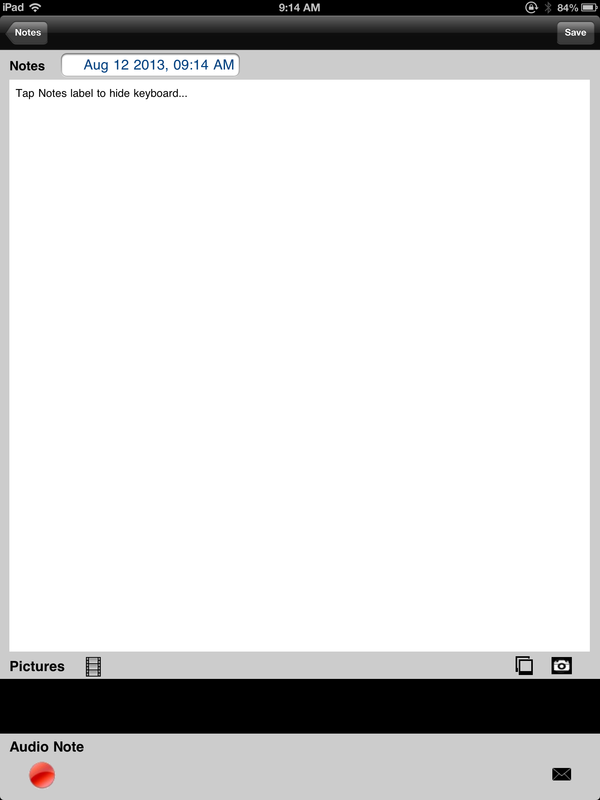 iConnect- Notes Edition app (iPhone/iPad; free) allows you to create a list of clients/students with contact information and ability to create notes, take or import pictures and email the information individually or as accumulated to yourself. It is not a data collection app. A passcode lock option provides the needed security for client/student information confidentiality. Notes button on lower right screen provides a method of creating a note. The note page allows options of taking a picture, importing a picture as well as creating an audio note when needing to annotate information on a therapy session on the fly. Notes created are populated with a date and time stamp automatically inserted. Workflow of the notes can be emailed individually or using the button “Mail All Notes” for archiving or use in other programs. Below is an image of a note with pictures inserted in an iPhone/iPod. iConnect – Notes Edition app is a basic caseload app with the ability to annotate and add pictures. Although it does not have data collection tools, it is an easy and basic app that can be used to manage caseload information. The ability to annotate and take pictures used for pre-post status/skills (grasp patterns, wound, range of motion, coloring/writing samples, current equipment, etc. ) can be extremely useful as pre-post data, recall of physical evidences, equipment available or captured skills. The ability to lock the app for privacy is essential. A discussion with work based supervisor regarding use of client information on an app is recommended. This app could be a useful tool for therapists in the school or medically based for quick annotation of client/student information. Thank you Grembe, Inc. for offering this app for free! More for your therapy/ OT mTool Kit! This entry was posted in Administrative Apps, Apps for OT's, Clinic Based Interventions, Customizable app, Free apps, Geriatrics, Medical, Occupational Therapy, Rehabilitation, School Based Interventions and tagged Administration, iPad, iPhone, iPod, Note, occupational therapy, OT Apps. Bookmark the permalink. Thanks for all of your great information on Apps! I have a middle school student with Autism that is working on putting a book together with text and photos. There is quite a bit of text (at least 5 sentences per page). I would like to put this book on an app that he could share with friends and family, as well as print out. Could you recommend one that would meet these specifications? Bridget, check out Book Creator, 4.99 – http://www.redjumper.net/bookcreator/ . It has many possibilities of sharing, sending, printing a book. You can also share it and open in iBooks. Hope that helps. Thank you for visiting. know of good apps for an android? I am so intrigued with using apps but do not have ipad. Thanks. Also check out websites like Apps for children with special needs or Mom’s with Apps depending on what population you might be working with. Hi Stephanie, I apologize for the delayed reply. I have some Android apps on my app list but it is hard to keep up with both platforms. There are searchable data bases of Android and iOS apps for individuals with disabilities. Check out Bridging apps.com – http://bridgingapps.org/ or Friendship Circle app search engine – http://www.friendshipcircle.org/apps/browse/?filter_category=24 . Both have choices of Android in their app search.